"Are we really going to Dead End BBQ after the game," Trevor asked, calling Alexis over to the side of the football field tonight during a break in tonight's game. "I don't know," she replied, teasing about a weak arm tackle earlier, "are you going to hit someone out there and wrap up?" Trevor was excited because Dead End BBQ opened in Knoxville this week and we were eating there for the first time tonight. That's him under the sign. I was excited too, because I had met one of the partners this past May at a BBQ competition. I was intrigued when George Ewart told me of his plan to open a BBQ restaurant that serves competition quality BBQ every day. I'll do a full review of the restaurant in the coming weeks after their Grand Opening. But I can tell you that even during this "soft opening", I was thoroughly impressed with the facility, staff, and food. But in the mean time, I was able to get this interview in an email exchange with George earlier this week. You’re a BBQ enthusiast at heart, an architect by trade, and now a restaurateur. Did you do the design work on the building and what are some specific features based on your bbq experience that other architects would have missed? I did do the design work and what we incorporated was the process of smoking bbq into the building. Our kitchen line is open to the dining area and the smoke room is also viewable enclosed with glass windows. This way the public can see us working on the meats. Tell me about the building, is it a remodel or totally new construction? We bought an existing building and renovated it. Our goal was to make sure it remained a reclaimed building. After some research we found the building was the local grocery store for the Pond Gap Community and later added a barber and beauty shop in the building. In the mid 70’s it became a convenience store selling gasoline until we purchased it. Did you encounter any special challenges during the construction/renovation? Our goal as I mentioned was to make it look like a reclaimed building and once we removed the siding that was applied to the front façade we found the original brick. This was a pleasant surprise and allowed us to keep within our concept. Since this was an old building the roof was a big challenge after we found that there were three different roofs installed on the building, so we removed them all and put a new one on. Dead End BBQ Society is a competitive team and now a restaurant. Does the team own the Dead End BBQ restaurant or is this a different partnership? My other two team members elected not to be a part of the restaurant. There three partners currently- me, Jim Cornett and Robert Nutt. I bring the bbq knowledge and recipes; Jim has been in the restaurant business for ever and started Wok Hay which was bought by Ruby Tuesday’s; Robert and I have been friends for over 20 years and he is a very successful business man who created Concorde Microsystems which he sold to Siemens. What has surprised you during opening this restaurant? The number of people who have shown up with out any advertising on our part. We put our sign up on Wednesday prior to our opening that we will open October 5 and that day we changed the sign to say we are open. We projected through our trail/ training periods we might expect around 350 people the first day total and we served 275 lunches alone. It was unbelievable!! We have been blessed to have a steady crowd since Monday and pray that it continues. We have hired a very well trained staff and our management team is superior! They have been able to handle all of our adversities in a positive manner and are working everyday to make things better for the customer. What has been harder to learn so far, BBQ competition or running a BBQ restaurant? Both have their challenges. I think it was competitions since I have had Jim to help out with the restaurants side. How has competing prepared you for the restaurant biz? I learned through competitions that it is not what I like as far as taste it’s what 6 different judges like. So we created rubs, sauces and techniques to offer varying tastes within each meat. The goal is for someone that likes spicy, someone that likes sweet and someone that likes mild to get all of those flavor sensations in the same meat. In what ways do you think your BBQ com petition may benefit from the restaurant side? It will allow me to experiment with new recipes and see what the general public likes or dislikes. 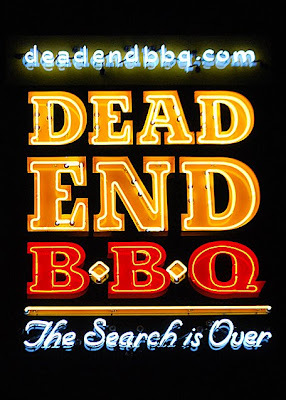 What’s different about Dead End BBQ than your run of the mill BBQ franchise restaurants? Simple, we cook food like we are in a competition everyday! 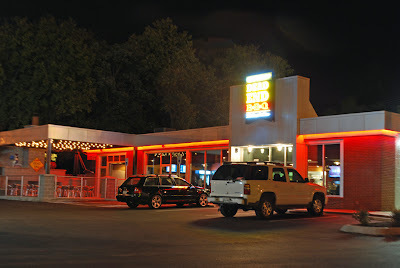 How does Dead End BBQ compare to roadside stands? The Dead End Society was formed within our neighborhood in order for us to get together and have fun. This is our goal to have a neighborhood party atmosphere in our place every day and night! You are reaching for the BBQ holy grail, producing competition quality BBQ in a restaurant. How has that driven your choices in personnel, equipment, ingredients, and other areas? We wanted to have our personnel to reflect our fun atmosphere and we have been able to do that through our strong management team. Our equipment that we choose to smoke with are Fast Eddie Cookers by Cookshack which are one of the top smokers on the circuit. We have used all of the same ingredients we have perfected over the years. BBQ is a very regional cuisine. 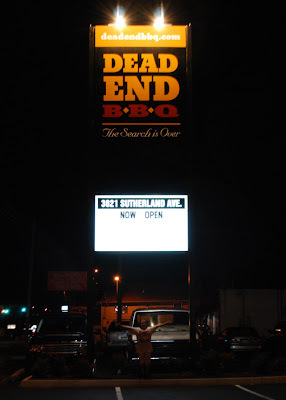 What influences or styles does Dead End BBQ use for it’s meats and sides? We want to create a style of BBQ and sides that do not reflect a regional per say style other than competition or Knoxville style. I think people get caught up sometimes on the style instead of if it is actually good or not. People ask me is it dry or wet; Carolina or Memphis, I just say our style is good. Will Dead End BBQ do take out, catering? We will do take out and catering eventually adding things as we go, for example within the next couple weeks we will start doing take out. Catering will mostly like be within the next two months. We are concentrating on getting the restaurant right before we start adding things. What are some of the signature main dishes? We have won awards in every meat category so all of them are special to me. My favorite dishes include brisket, last year we finished 12th in the world in brisket!!! The Tennessee Beef and Cheddar sandwich is off the charts. What are the standout side dishes? Mac’n’cheese, slaw, beans, greens as a matter of fact all of them are great. The bbq queso and nachos are very good appetizers. Does Dead End BBQ utilize local suppliers when possible? Yes that is our goal. Do you anticipate expanding to selling commercial Dead End BBQ rubs/sauces? How many local jobs did opening this restaurant create? 62 local jobs were created! I have so much more to cover but I'll save that for later. For now, I'll just say, if you live in Knoxville or visit, I strongly recommend visiting Dead End BBQ.